With the market leading InVentry sign in and visitor management system and Brother award-winning label printers, you create the right first impression every time for your visitors. Managing visitors in your organisation is a seamless and speedy process, with our market leading visitor management system. Visitors are presented with an easy to use state-of-the art touch screen that significantly speeds up the signing in process. 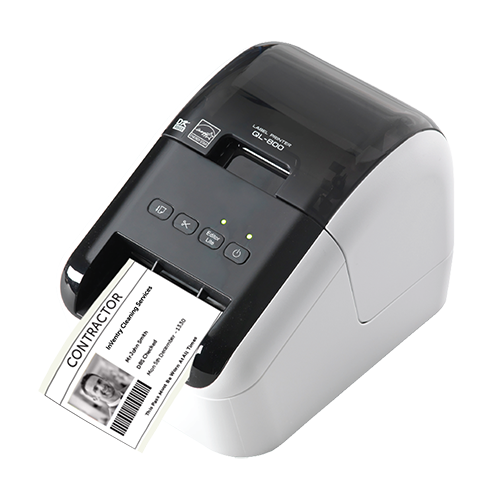 They are then instantly provided with a high quality ID badge from the Brother label printer. It means you can track the whereabouts of visitors and accurately record visitors entering or leaving your site. It provides site access in a way that safeguards those who are on your site and completely removes the need for paper-based visitor books. When a visitor signs into the system it can instantly send a SMS or email to the staff member letting then know their visitor has arrived. We have incorporated our health and safety briefing so that when a visitor comes to sign in, they’ve got to read and agree to it before they can go to the next page to actually sign in”.